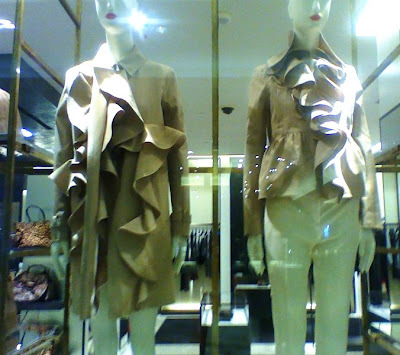 When I saw these two pieces at Valentino window, I couldn't help to stop and admire these savvy ruffle jackets. I had to literally wipe drool off my chin, which was not savvy at all. With so much ruffle, one would think the look would be over the top but the loose ruffle makes the look so casual, elegant and feminine. Okay, I am gushing!!!! I hope the jacket on right goes on sale so I can pick one up. ~Smile! What do you think? *Don't forget to enter Elizabeth & James ring giveaway here! I've never seen ruffles on jackets before. And these are super cute! I'm with you dear - the right one is gorgeous and hope it goes on sale! Love them. But I pretty much love anything with ruffles. That one on the right is gorgeous! I think what keeps this from being Ruffle Overload is the fact that these ruffles are so large they're almost architectural-looking. Gorgeous. Love the one on the right. The one on the left is a bit too much. Siiiighhh. Gorgeous, gorgeous, gorgeous. Ruffles at their finest!